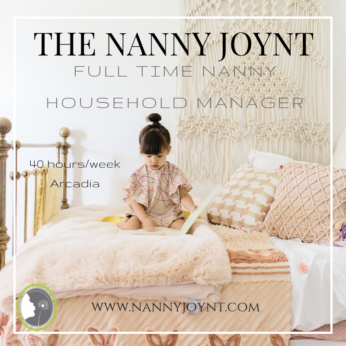 The Nanny Joynt is working with a wonderful and loving single father of a sweet, energetic and independent 4 year old little girls seeking a full time nanny/household manager to assist with day to day responsibilities. This position will be Monday – Friday from 11am – 6pm with flexibility to stay until 7pm on occasion. Dad has his daughter on a 2-on (Monday, Tuesday) 2-off (Wednesday, Thursday) 3-on (Friday, Saturday Sunday) and then it reverses 2-off (Monday, Tuesday) 2-on (Wednesday, Thursday), 3-off (Friday, Saturday, Sunday). The nanny assists with the child at both the dad and mom’s houses (3 minute drive). Both mom and dad have a very amicable relationship and always put their daughters best interest at heart. It is important that the nanny he hires be available to cover a full day should the child be sick or have no school. Summer hours: The little one will be in camp 3 or 5 days per week. If she does 3 days per week camp T,TH the nanny will need to come around 8:30am/9am. This position is offering $20/hour with guaranteed 40 hours per week, paid vacation, paid sick days, paid holidays, and mileage reimbursement. The little one is in school Monday – Friday from 9am – 3pm at a Spanish immersion school. The nanny will need to be available to pick the child up from school and bring her home or to after school activities. The rest of the time will be spend doing household management only at the father’s residence. This family would do best with a nanny who is fun, engaging, nurturing, creative, and an excellent communicator. The ideal person for this position is wonderful with kids… able to speak their language so to speak! Someone who can serve as a resource and sounding board for dad and really support him in raising a wonderful and kind little girl. A nanny who enjoys spending time with his daughter who will plan fun and engaging outings, activities and playdates. Bilingual in Spanish would be a plus but not required. Child related responsibilities: Picking the child up from school, meals/snacks, playtime, transportation to after school activities, planning fun outings, organizing playdates with other nannies/kids, arts and crafts, bath time etc. Household related responsibilities: General tidy of the home, load/unload dishwasher, organizational projects, family laundry, errands, grocery pick up, simple meal prep, changing linens once a week, sorting mail, possibly paying bills, shopping for the child if she needs new clothes or has a birthday party to go to, planning birthday parties, decorating for holidays etc. Nanny would arrive to the home prior to school pick up to take care of household tasks. Family employs a housecleaner bi weekly so this position will be maintaining in between. The ideal candidate for this family is someone who is easygoing, playful, fun, happy and genuinely enjoys caring for children and helping a home run smooth. Nannies this is a WONDERFUL family! They have employed one of our nannies for the past year and we know this Dad is super generous and really treats their nanny like family! If you are interested and meet the requirements above, please comment below and email your resume to trisha@nannyjoynt.com with “TNJPT42” in the subject heading.